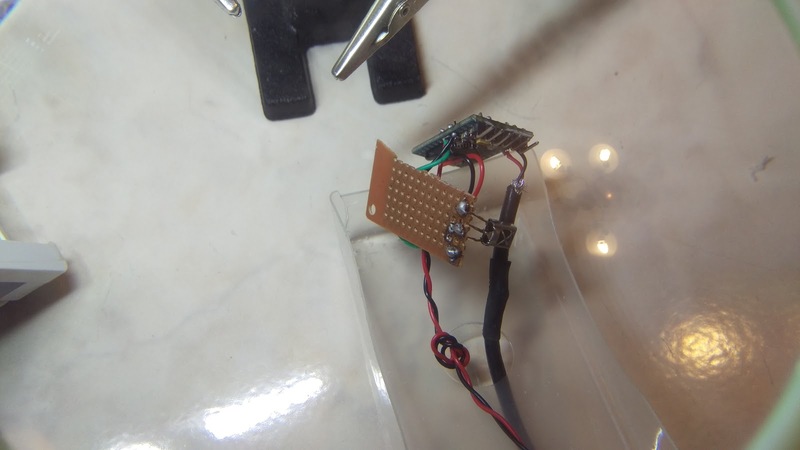 If you want to see the complete tutorial, please visit IR Repeater Tutorial Part 1 first. 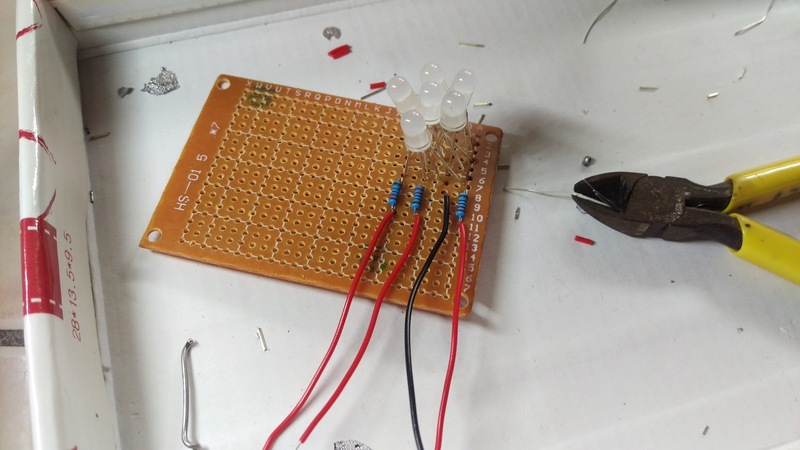 It's always a good practice to test out the wiring before solder components together. 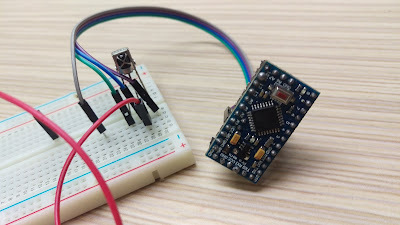 * A visible LED can be connected to STATUS_PIN to provide status. After programming code is copied into Arduino IDE, upload it to your Arduino Pro Mini. 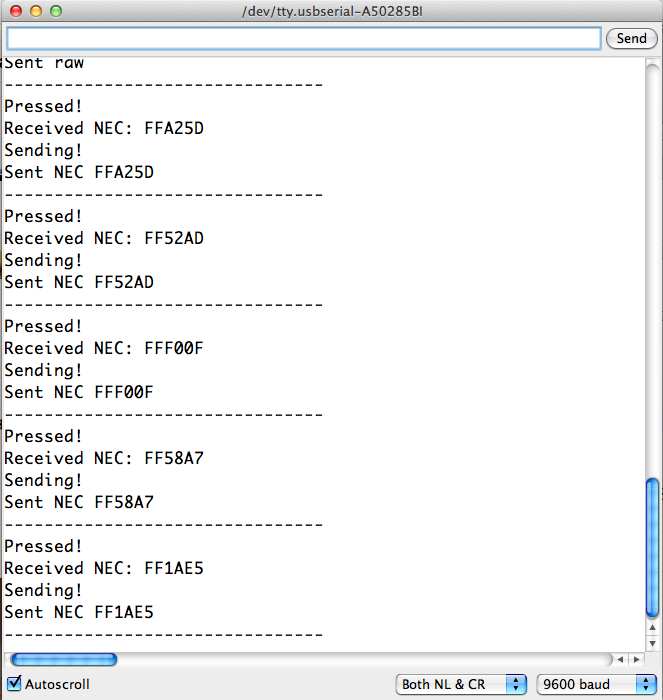 Here shows you the IR command received through the serial port monitor. After fully tested, it's time to solder everything together. First, solder IR emitter LED to the extended long wires. 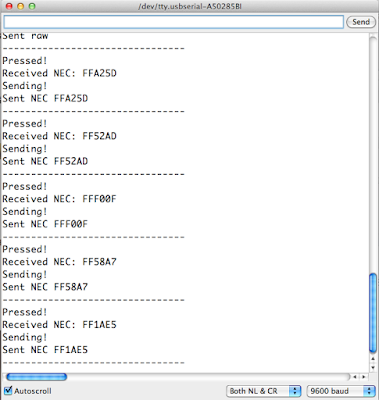 Although not showing at the photo below, an 100 Omh resistor is needed on the data pin 2. 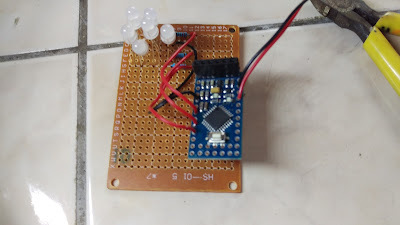 I soldered the IR receiver LED on small proton board to allow me to fix it into the IR BOX easier. 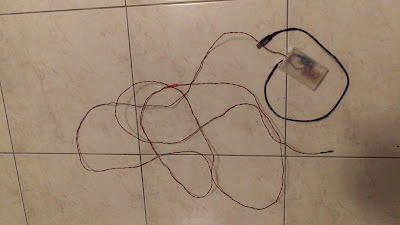 To provide constant power, I decided to use a smart phone power adaptor through a USB connector. 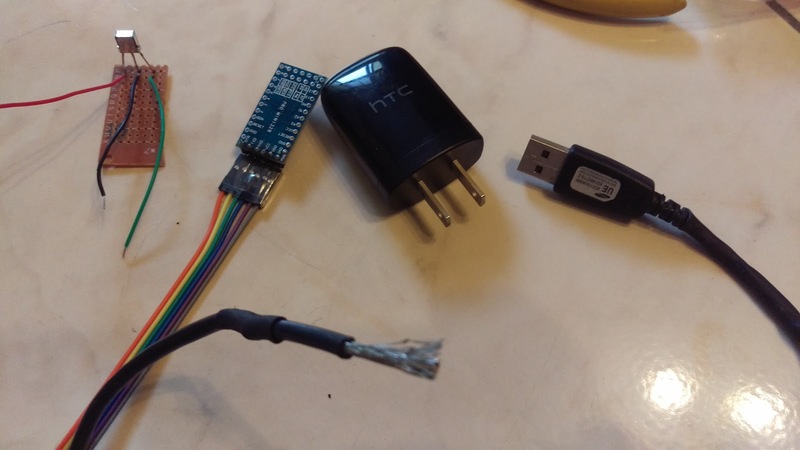 There are 4 tiny wires in the USB cable and you only need black and red wire to supply power to Arduino Pro Mini. Red connects to VCC and Black connects to Ground. I've chosen to use a name card case as the enclosure. 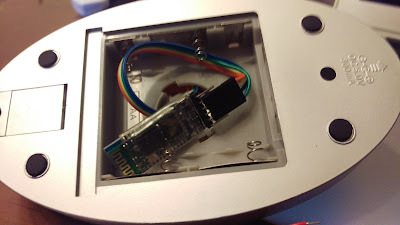 I drilled a tiny hole in the front of the name card case (see below), to expose IR receiver LED towards the edge. 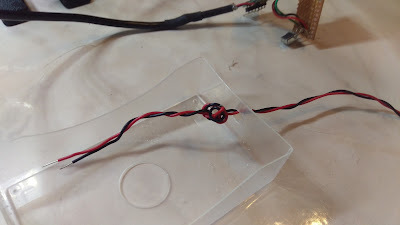 Too often, accidentally pulling the wires will break the soldering part, so I tight a knot on the extended long wires to secure wires in place. 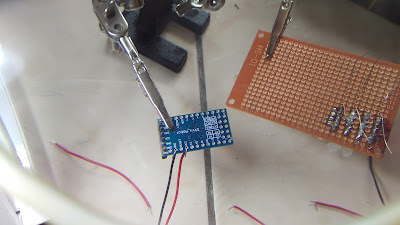 Now, every parts are soldered together as you see below. 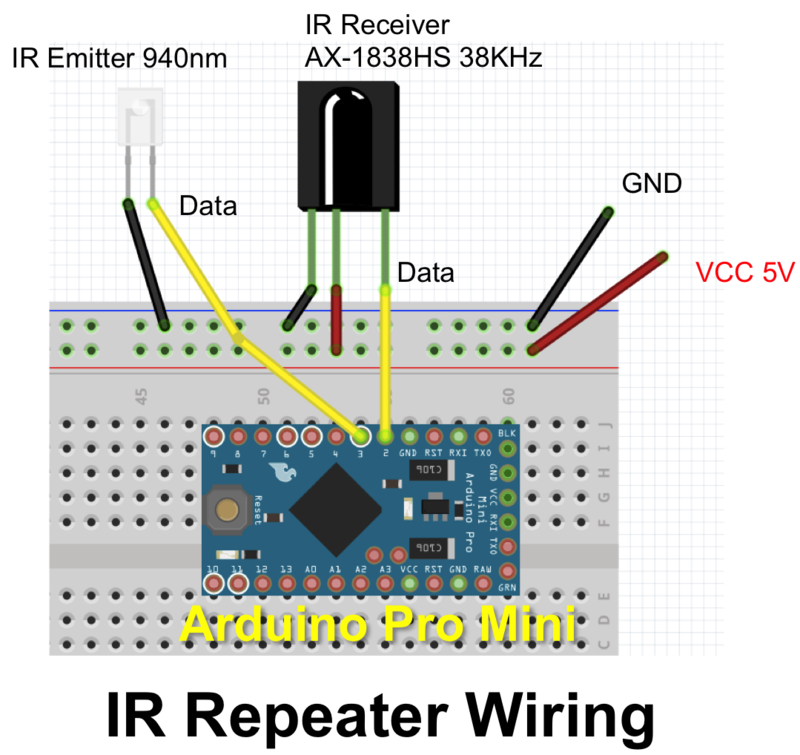 Emitter board and Arduino Pro Mini placement is looked like this below. Then, I glue the entire board with a glue gun to secure PCBs inside the name card box. Plug the USB adaptor to power it up. Great! It's working. Below is how this project looked like. 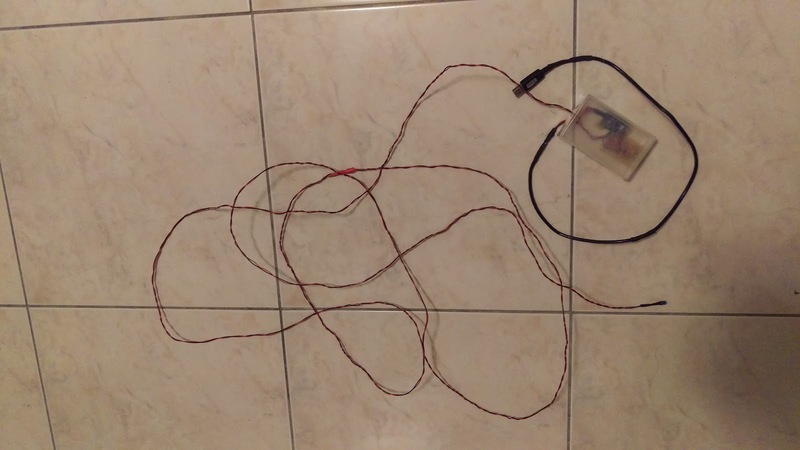 As you can see, the extended wires are almost five to seven meters long. After the setup, I've been use this IR repeater for 2~3 weeks and it's working perfectly without any issue. If you would like to make your own, you can follow this tutorial! See the video below, if you haven't! To share a Set Top Box in living room with Bedroom TV using the same Remote Control. Recently, I subscribed a VOD (Video On Demand) service that came with a Set Top Box in the living room. However, I would like to occasionally watch VOD in the bedroom, but the Set Top Box is in the living room. 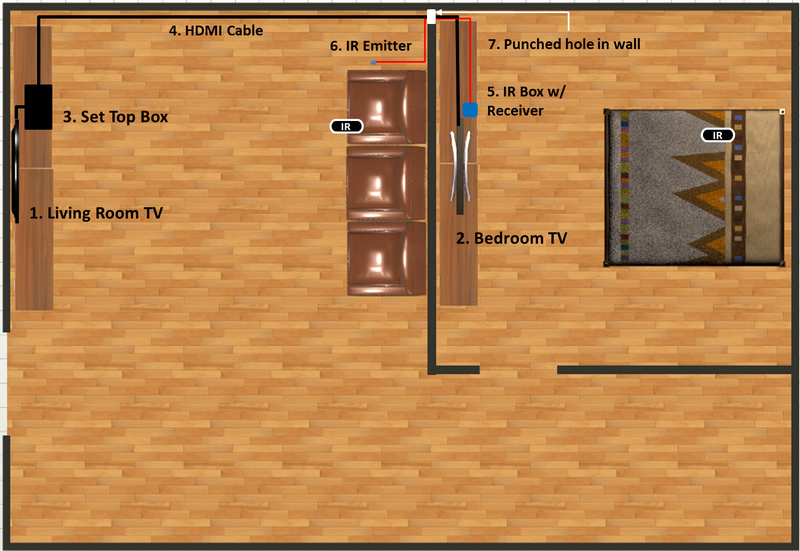 As you know, there is no way to control the Set Top Box in the living room from the bedroom. Yeah, an IR repeater is all I need. 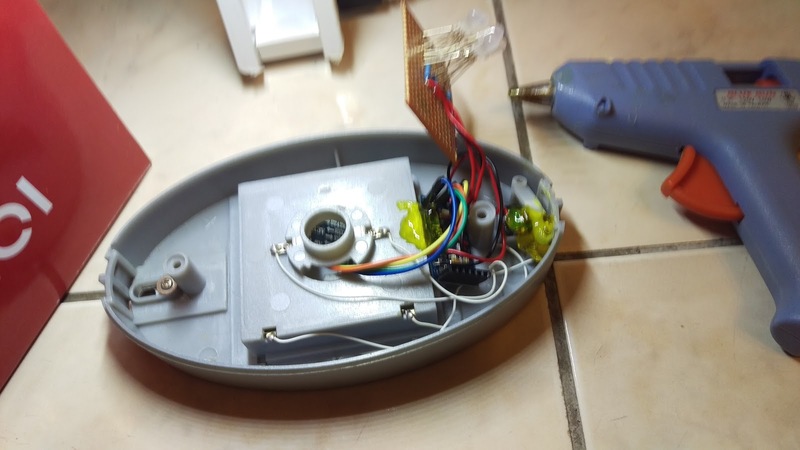 There are commercial products available in the market already, but I quickly thought about the Control celling light with a TV remote Arduino project I have done before might be an replacement for the IR repeater I need. After all, this is why I learn Arduino - May my life easier!! Either one VOD TV program can be watched from living or bedroom at a time, since the Set Top Box is shared. 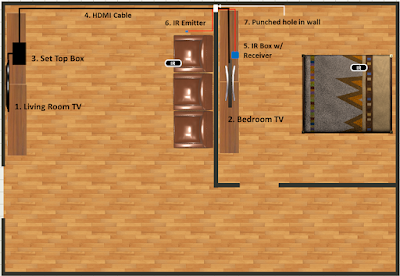 The illustration below shows you how the whole IR Repeater is setup in my apartment to share Set Top Box in two rooms. 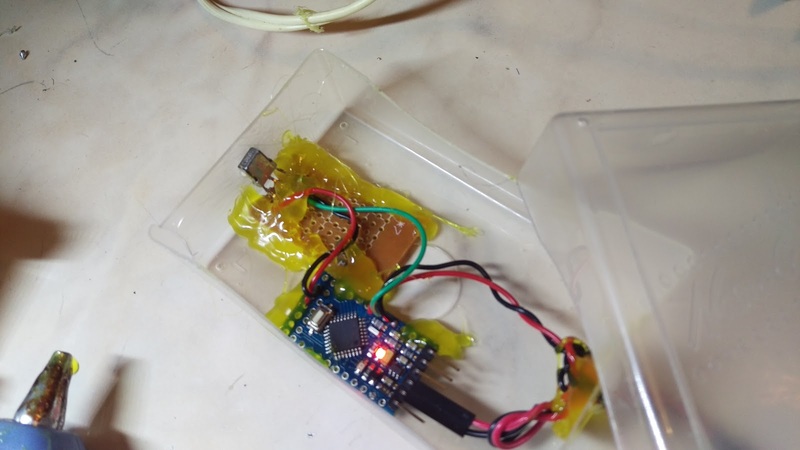 See the working prototype in the video below. As you can see, even through the IR repeater, the Set Top Box response time is fairly quick! Starts from the left: IR LED receiver, IR LED emitter, green LED, and red LED. In the end, I didn't use red and green and LED, but relied on the Arduino built-in red LED on pin 13 and Serial port green LED in this project. 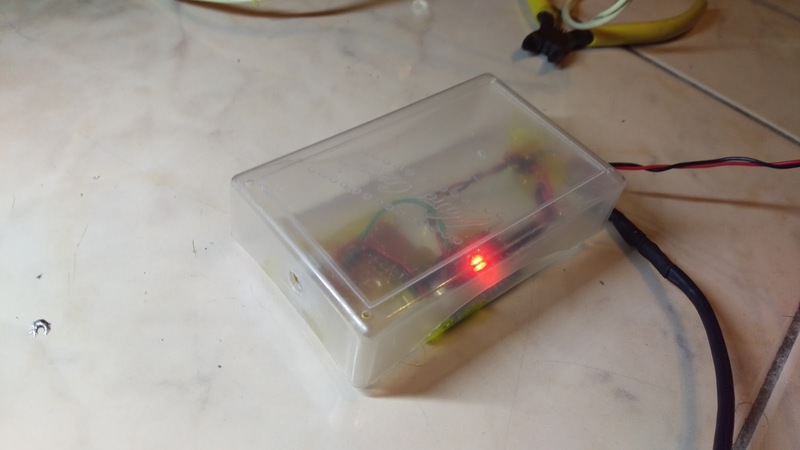 In part 2, I will show you how I made the IR Repeater box, schematic, and Arduino code I modified from github by Lauszus. If you are interested, you may take a look at the code first. 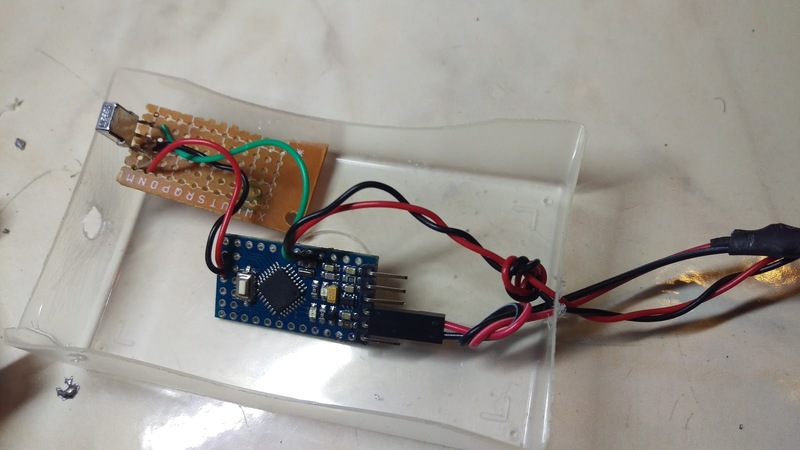 這個專案裡，我最後沒有用到綠色 LED, 紅色 LED，我用的 Arduino 內建在13腳的紅色 LED, 和 Serial port 訊號的 LED. 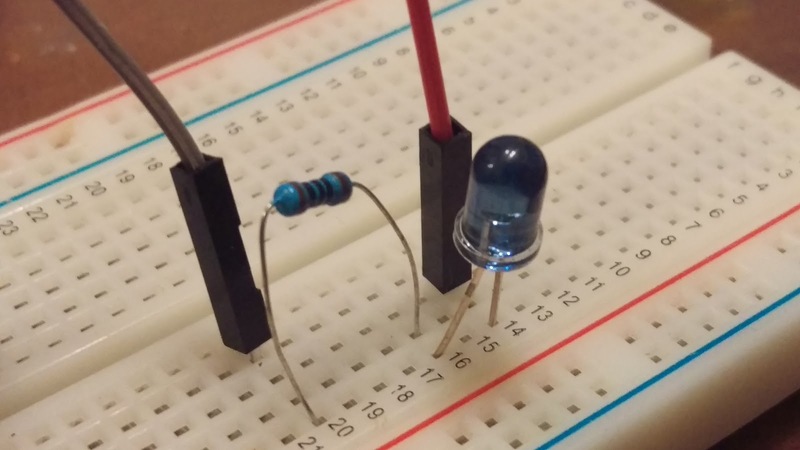 It's been a while since I wrote the RGB LED tutorial on my blog. Not sure if you have done yours. If you would like to learn the whole project from the scratch, please visit these two tutorial first. Recently, I have found a night lamp laying around and we were not used it anymore. 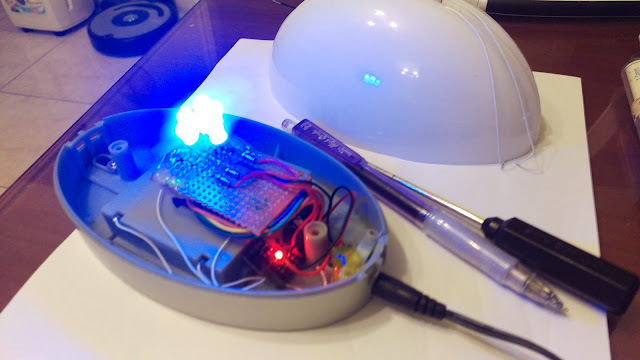 I thought, umm.. it might be a good idea to DIY RGB LED into this lamp. Let's get started! 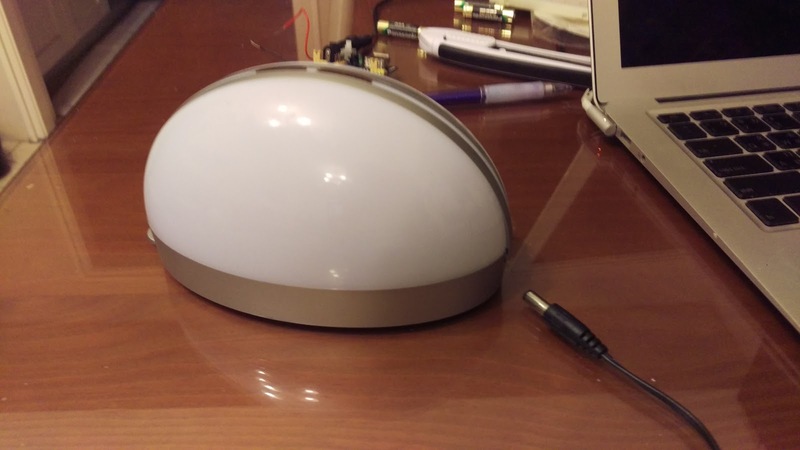 This is what the lamp looks like below. It's powered up by a 9V/300mAh adapter. Since Arduino Mini Pro only take 5V or 3.3V, I had to replace a 5V/500mAh adapter from older 2G phones to use with this night lamp. 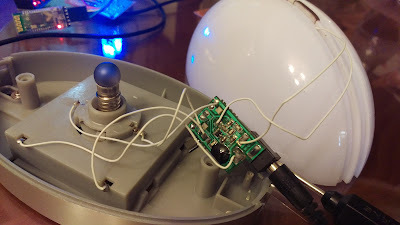 After I opened the light lamp, there was tiny PCB, few wires, and a very small lightbulb under the transparent cover. I removed most of stuff inside to make room for my Arduino board. Since this is a night lamp, there is no need to let this lamp too bright. I decided to use 6 RGB LED to be the light source. 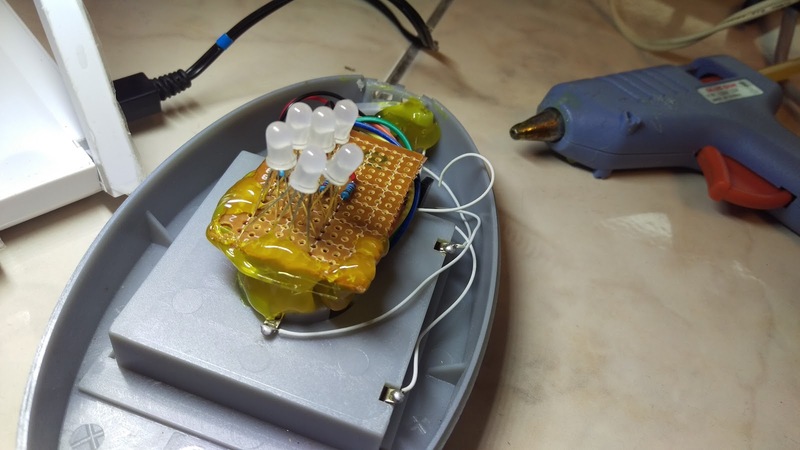 Please refer to my RGB LED tutorial 1 to see the how to wire up. After soldered the LEDs, resistors, and wires, I cut down extra LED legs to ensure they could fit into the lamp. 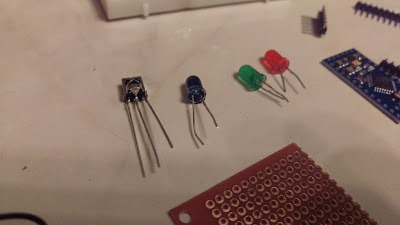 There were only few things to solder on Arduino Mini Pro pins with RGB LED and signal wires. 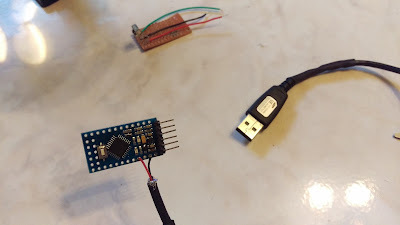 Remember to connect TX on the HC-05 to RX on the Arduino and RX on the HC-05 to TX on the Arduino, so Arduino can receive data correctly. 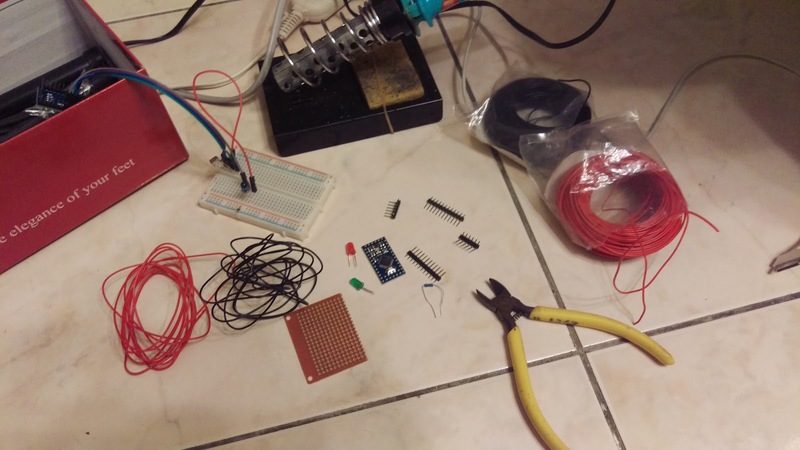 All parts were soldered together; including Arduino, wires, RGB LED. 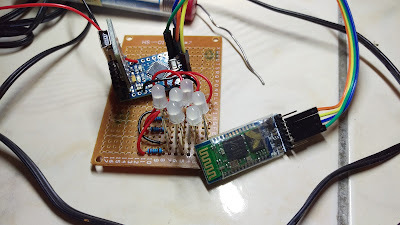 Then, I attached HC-05 Bluetooh module on the the Arduino Mini Pro. I also cut the porto board in half to save more space below. 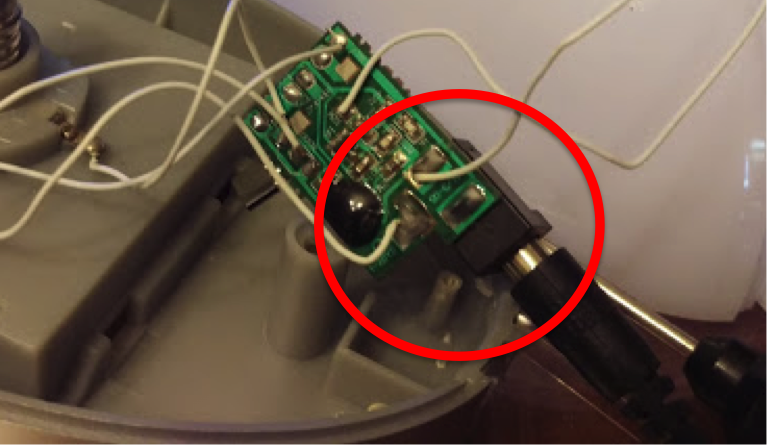 Look at the picture where I circled, I needed to keep the original connector to connect to Arduino Mini Pro, so the power plug can be inserted correctly into the lamp plug. 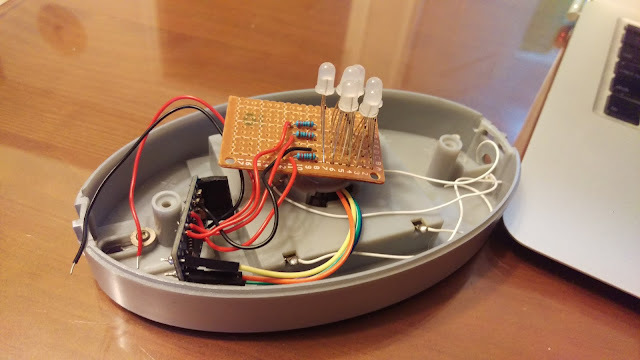 Here is the original PCB module come with the lamp. 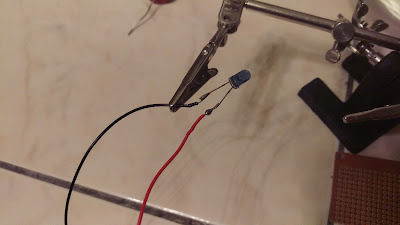 I just removed the connector with a plier instead of desoldering it. 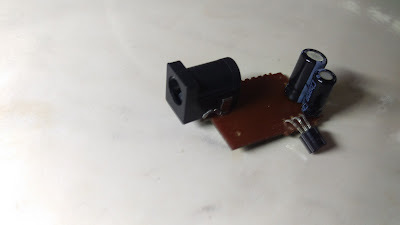 Believe me, I did try to desolder the connector from the PCB and it was really difficult for me, even with a tiny tool that sucked the soldering away from PCB. ** Fast flash: Not connected. ** Flash twice per 2 seconds: Connected. 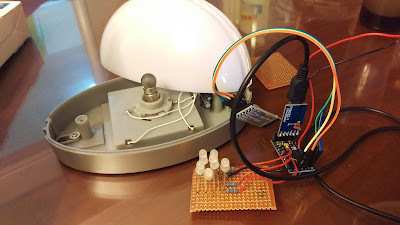 After removed the light bulb, I was trying to find the perfect spot to place PCB and Arduino Mini Pro. 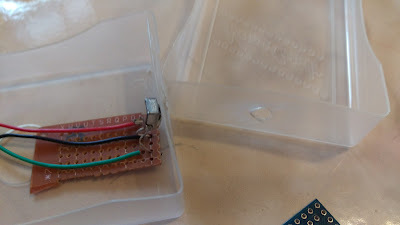 By the way...I almost forgot to solder the connector back to the power wires. 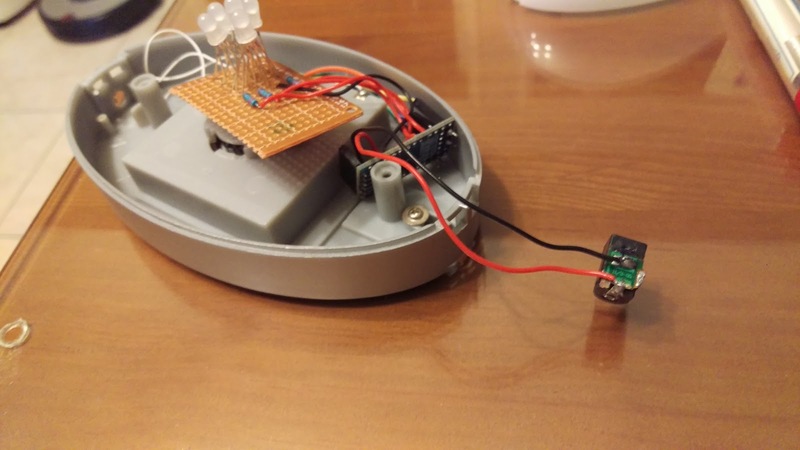 Now, it's time to put all components inside the lamp. I decided to use hot glue to place the PCB with RGB LED on the center and inserted Arduino Mini Pro next to the screw column. Secure the connector with the original screws and a lot glue to keep them in place using a hot glue gun. 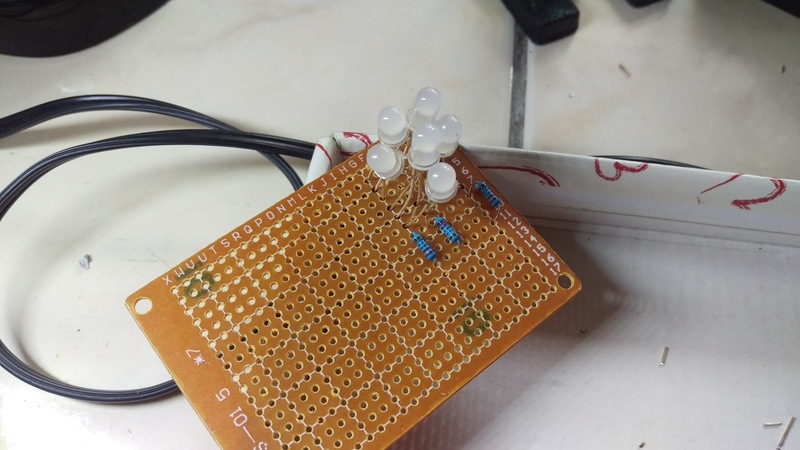 More hot glue to ensure the PCB and connector to fix and secure. Power it up! Cool, it's working now! I modified Arduino programming a little bit to set my PCB to light up with Blue color as soon as it powered up. Finally, I placed the cover back and tighten two screws and it's done! This is my 2nd projects that really worked!